TOTAL BODY WORKOUT – Our gliding disc allow you to perform exercises that target every muscle group, particularly the core. ALL SURFACES – Either at home or at the gym use our Core Sliders on any surface such as Wood, Carpet, Rug or Tile. INCREDIBLE CORE TRAINER: Sliding discs requires constant core stabilisation which delivers an incredible core workout. 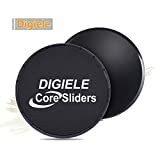 COMFORTABLE & DURABLE – Use these exercise gliding discs for core strengthening, athletic conditioning, CrossFit, Hiit, physical therapy, yoga, dance, balance training and more. AT HOME OR WHEREVER YOU GO – Small and lightweight, these gliders fit into any travel bag, making them the ideal choice to make sure you’re staying healthy even on that family vacation. -Our Sliding Discs deliver an unparalleled core workout. They can be used to target all muscle groups, from chest to legs for total body workout. -The very nature of training with our core sliders involves the core and supporting musculature. Training of these aspect results in excellent carryover to most sports and real life disciplines. – Use for all surfaces: Hardwood floors, Carpet, Rug, Tile. – Each gliding disc weighs just 100 grams (3.5 oz). – Each sliding disc has a thickness of 1.25 cm (0.5 inches). – Gliding discs diameter 17.8cm.